Well it was just announced that the You Need a Budget (YNAB) iPhone app was published so I just had to try it. Note: if you do not run the YNAB desktop software this will be useless to you so don’t waste your money, unless of course you are going to pickup the full version of YNAB in the process. If you aren’t familiar with You Need a Budget you might want to read my full review of the latest version of YNAB to get the 411 on this fantastic budgeting tool. The YNAB iPhone App is essentially a frontend for your YNAB budget that you can carry with you. The first thing you do is synchronize it with your PC or Mac over your wi-fi network. This worked flawlessly for me. You need to have a Wi-fi network that will connect your iPhone and your computer otherwise this isn’t going to work at all. You could also setup an ad-hoc network if you had a wireless card in your computer and sync that way. 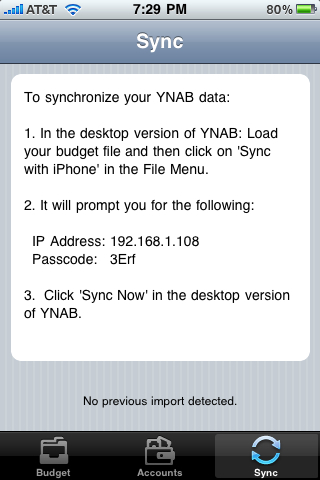 Once it’s online it gives you it’s IP address and a sync code that you enter in your YNAB desktop version. 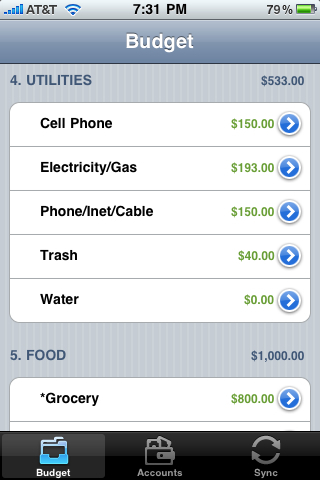 It synchronizes and wham there’s your budget right on your phone. I run Windows 7 on my desktop, so I can’t comment to the functionality of any other OS or platform but it just worked without any tweaking or troubleshooting on my part. I’ll keep my ears posted of any platform issues but it should work equally well on Mac’s and Linux boxes. This is it, the whole reason you’d purchase this app is that you want to be able to bring your budget with you when you’re out and about, and then be able to quickly enter transactions that can sync back up with your full blown YNAB version. It does that quite well. When you bring up the Budget Window you see all of your Master Categories with their respective sub categories and their current balances. By tapping the subcategory you can enter a new transaction which is very quick and straightforward. When it synchronizes it pulls in all of your already entered payee’s from the desktop version so you can autocomplete that entry. Put in a few more details and you’ve now entered a new transaction. You’ll need to synchronize back with your desktop in order for both to be in parity. 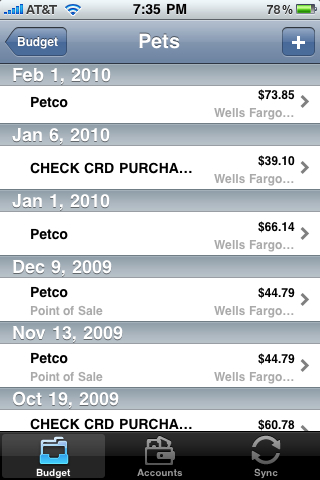 In each category you can view past transactions by tapping the blue right arrow and see where your money has gone. You can further drill into each transaction to see the details including which account it came out of and the memo for the transaction. Well that really covers it. It’s a relatively simple app that certainly doesn’t take the place of your desktop software but working in concert with it can be a powerful one-two punch. It does have a few shortfalls. I would love to see some form of graphing in the app to see how you’re doing, and some more options as far as actually tweaking your budget would be welcome. There are two issues that YNAB is already working on addressing which is the inability to enter split transactions or transfers which will be available in the next update. This app isn’t for everybody, but if you really like to have your budget with you at all times and you use YNAB then this is the ticket. Be forewarned it’s a little pricey as iPhone apps go at $9.95 but for geeks like me that’s money well spent. 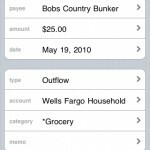 You can find it at the iPhone app store by searching for YNAB or a direct link to the iTunes Store. 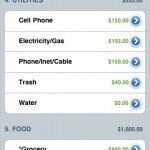 SnapTax bringing TurboTax to your iPhone. Really. How much does the app cost? Why / how did you choose YNAB as your money management software? It’s $9.95 for the app. I chose YNAB after trying every other budgeting program available. I’m still working on my full ebook which compares 15 different programs, online and standalone. YNAB has the best setup around your budget not budgeting as an afterthought like so many of them. True it doesn’t track investments or automatically sync to your bank (it’s a manual upload) but overall it’s budgeting features and interface can’t be beat. There’s a link to my review in this post if you want to read the full details. 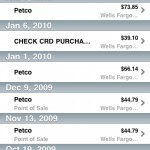 The Purchases Tracker iPhone/iPod Touch application was created to help in tracking monthly expenses and getting a handle on where our family’s money was being spent. 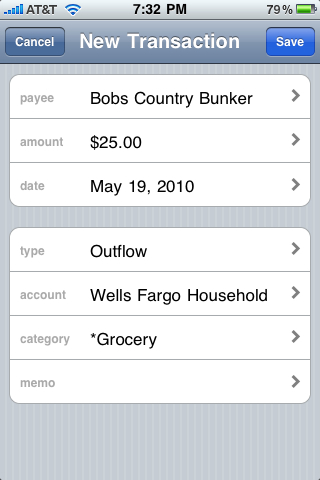 Purchases Tracker was designed for tracking purchases, receipts and managing cash flow. Its great for the “Road warrior” looking to ensure all your travel expenses are reimbursed, for those just looking to get a handle on their purchases, and it gives you the ability to compare past prices for items you have previously purchased. Thanks, Paul for a great review. Carrying your budget with you and recording transactions as you spend gets you pretty much as close to the traditional physical “envelope method” as you can probably get in our digital world. Congrats to YNAB on the iPhone release. For those who are in the Android world or are looking for an in-the-cloud envelope budgeting solution with native app support, you might consider the Easy Envelope Budget Aid (EEBA for short). It’s a free Android app with associated website service that we’ve been working on. It’s based on envelope budgeting or zero-based budgeting, much like YNAB. EEBA has a website, a mobile website and an Android app that makes it super-easy to check your envelope balances and record transactions at point of sale. Basically it allows you to carry your virtual “envelopes” with you. An advantage over YNAB is that it syncs everything automatically between multiple phones and the website and can be used with or without a cell signal. That is, instead of needing to sync back to a desktop app over Wi-Fi, transactions show up immediately (or with a few second delay) on the website (and on your spouse’s Android phone). On the other hand, we don’t have full Accounts support yet (although that will be coming very shortly–in testing as we speak). EEBA has much of the goodness of YNAB in being at its core organized around budgeting, being able to carry over budget balances from month-to-month etc. We’re in open Beta right now, website at https://www.eebacanhelp.com. Give us a try and let us know what you think! Having an app at the touch of a button where ever you are is very helpful. Apple comes out with a lot of useless apps, this ones seems decent. Nice review. Next post: Is Your Car Ruining Your Budget?